...and I wasted it all in sixth grade . Sixth grade could be most easily described as being the beginning of the end. It was a time of growing up and moving forward -like it or not. All of us on the block were young and burdened with homework. We had an incredible lack of desire to learn anything in school. The only really good thing about school was sitting next to your best friend who likewise suffered through each subject. If being stupid was the order of the day, then it was best to have someone to be stupid with. However, I wasn't altogether stupid. I excelled in art and lunch. Each morning brought the flag salute , then roll call. Arithmetic usually came first while Social Studies and English were saved for the yawning half of the day. If you had any small toys you brought them to school with you as companionship. Of course, you had to be careful. Teachers were good . They made their living by acquiring and collecting our toys with swift calculation. My sixth grade teacher was exceptional. She had powers and capabilities beyond those known to mankind. Still, she permitted some toys as long as they didn't interfere with our work. Naturally, my toys always interfered and were always confiscated. There were days however when she would reach her boiling point. (a temperature of about 2000 degrees Fahrenheit). All commentary aside, Mrs. Bishop was a very good teacher, and I liked her very much. I had just purchased the new Aurora model "The Chamber of Horrors Guillotine" . I had also made the tragic mistake of taking it to school with me after its completion. For any of you that may remember this model, you could actually chop off the head of the victim tied down to the platform. This was great fun at home, thrilling in the school yard, but during sixth grade English, it was just plain foolish. The plastic head flew off, and rolled across the floor. The teacher's eyes went right to it. Forget about the fact that I was scurrying across the floor like a rat trying to chase it down. Forget even that the whole class had turned to see what was more interesting than past tense verb conjugation. It seemed that perhaps I should have been beheading my prisoner during history, because I was then prompted by the teacher to give an factual lecture on the history of the guillotine for the entire class. "The history? Well...I've had it for about two weeks." The guillotine went home with me that day, accompanied by a note from the Principal for my parents to call the school. He was concerned by my bringing such a "morbid toy" to school. Thankfully, my mom thought he was ridiculous, and told him so. It was a well known fact that girls were smarter than boys. It didn't matter who she was; if she was female, she was smarter. Girls were well-behaved and paid attention in class. They had good penmanship and raised their hands often. Is it any wonder why us guys would have nothing to do with them? Girls were notorious brats; unlike us guys, they were often willing to learn instead of just doing their homework and assignments. Of course, down the road, it came abundantly clear to me that perhaps they'd had it right all along. All you needed was a pencil to make these wonderful plastic troll-like figures known as "Creeple Peeple." On the day that I'd saved enough money to buy one of these sets, "Georgy Girl" by The Seekers was a hit song on the radio. I can't hear that song today without thinking about my "Thingmaker" . 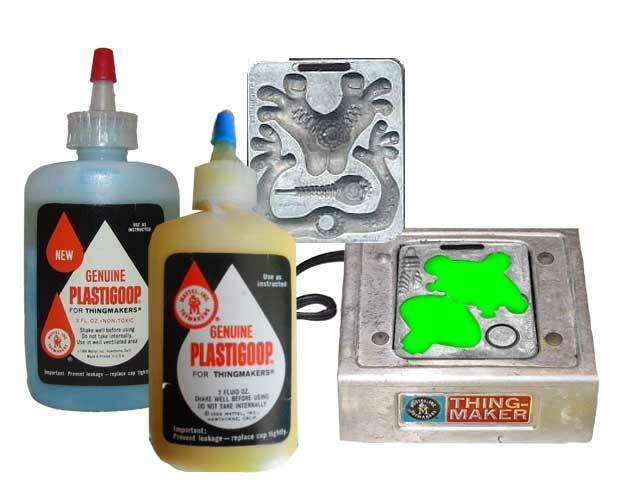 The smell of the plastigoop bubbling was unforgettable. You could also mix the colors and make swirls and get wild color blends. This set came equipped with neon colored hair and a paper cut-out wardrobe for the Peeple. I later got the "Fright Factory" set, but it wasn't as great. It seemed like it would be the ultimate, considering my love for monsters and horror movies. It was however, a "grave" disappointment. The creations were too goofy looking. The box was better than the whole kit. I also had creepy crawlers which wasn't much better. For me, the Creeple Peeple set was the set to have. It made real toys, tangible creatures that lived on a pencil. Read more about these sets here. Matchbox Cars became a sweet obsession. I collected them and had an almost complete set. I lose track now of just how many there were. My first ever Matchbox Car was the "Airport Crash Tender" . On the day that I bought it at Newberry's toy basement , I'd been watching "Family Affair" on TV, and listening to "Up, Up and Away" on the car radio on the way to Eastport Plaza. 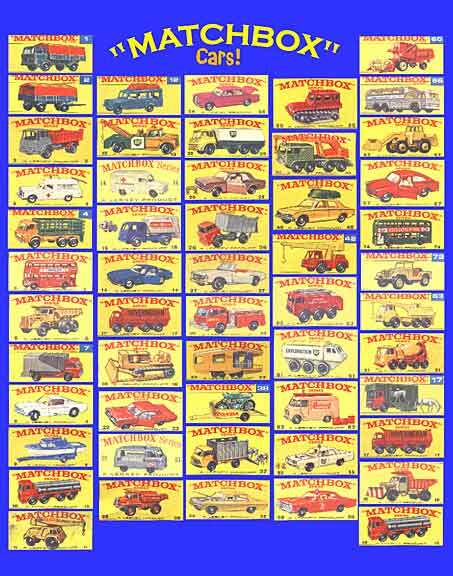 My three favorite Matchbox Cars were the Crash Tender, the London Bus, and the BP Exploration truck. The latter, a white, 6-wheeled vehicle that looked as if it might be aquatic, was perhaps, my all-time favorite. My parents set about the task of building me a city scape diorama for my Matchbox Cars. It was a long and pain-staking event which was a real arts and craftsy type thing for them. They enjoyed it more than me. It was very well done though, with 2 houses, a fire station, a construction yard, church, and a few winding streets. I also had a Matchbox Service Station . Read more about my Matchbox Cars here. A day of go-carting, a tube of glue + 1 plastic model + 2 red licorice ropes + 1 bizarre horror movie = one great day of fun. I was for awhile, the envy of the neighborhood. My brother Pat traded an old re-built color TV for a real go-kart , complete with engine and steering wheel which he gave to me. I used to take it up to the church parking lot on Saturdays when the place was vacant. Pat was a genius. He built mini-bikes by the dozens just for the fun of it. He also built what he called "Tote-Goats" , mini-bikes that were larger, built from one of those 60's kitchen chairs with the U-shaped legs. Pat was 6 years older than me, but born on the same day as me. We lost him in 1996. Another artifact from my past: this "Forgotten Prisoner of Castel-Mare" that I bought from either Fred Meyer on 82nd and Foster, or the hobby shop that was near 42nd and Woodstock. Hobby shops were amazing! It was a world unlike anything, or anywhere else. For me, as a kid, hobby shops were the holiest shrine on earth. That evening, while taking a break from building this model, I watched "Mr. Sardonicus" on TV. That movie scarred me for life as it was wonderfully terrifying. Tarzan: one of the swinginest cats in the jungle. "Tarzan" was still as much a hero to me in 1966 as he was during my earlier years. The real difference is that I was old enough to truly appreciate him more. I took more notice of the jungle scenes, (especially the swimming scenes since I was such a nut on underwater adventures). I also took more notice of Jane and her skimpy outfits. I was truly seeing just how beautiful Maureen O'Sullivan was, and how much more she added to the story lines. Usually, Tarzan movies played on the afternoon movie at 4:00. The local station would run a marathon, playing them everyday during the week. My best friend and I would rush home from school in order to catch them on TV. We even tried our best to create vines, or anything to swing on, but there just wasn't much fun in that. The climbing ropes at school were perfect, but the gym teacher would go ballistic on us when he caught us at it. Eventually, after a few movies in the Weismuller series, Tarzan had a pretty good jungle set up going. He had "Boy", "Jane", and of course, "Cheetah." He and the family made the most out of tree living. They even had a type of refrigerator with running water that kept fruit nice and cool. Whenever British hunters,or explorers came wandering through, Jane was able to hostess with the best. Tarzan movies also featured really awesome perils like tarantulas and quicksand. The worst thing to happen to my jungle hero was the TV series "Tarzan." This was a truly regrettable show, but being hypocritical, we all watched it faithfully. After all, Tarz, was Tarz, and you didn't have your choice of Weismuller everyday. Times were lean in between Johnny's good ol' reruns. IMPORTANT: Maureen O'Sullivan's outfit before The Motion Picture Production Code was enforced. Just who did they think they were anyway? !